I am wondering what you all would recommend for powering our new boat. They will be hanging the motor next week. We originally planned to use the 4.2 liter 250 Yamaha--but have been considering bumping up to the 300. 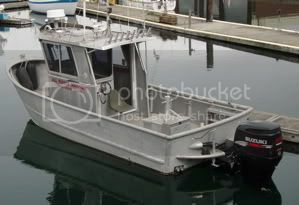 Our boat is a Riverhawk Cuddy Pro 24 feet with 2 foot offshore bracket. Dry weight is listed at around 4,500 lbs. Looking at the Yamaha specs--it looks like the 250 is a de-tuned 300--same weight and general specs, etc. We opted for a single main with a 9.9 kicker for salmon trolling. Any advice appreciated. I believe the main consideration is fuel availability. I think the 300 you have to run 89 octane where the 250 will run on 87 so its an availability issue and do you want to pay the higher cost for the 89. Weather you power or repower boats everyone seem to agree that there is never enough power and if you can afford it go for the max hp. The engine won't work as hard, higher efficiency, reserve power when needed the list goes on.